Dedicating some collecting activities toward vintage paperback books is a sure way to spice up your library when times are tough and money limited. The history of the paperback book in the USA is very interesting and merits comprehensive treatment but for now, I am only going to focus on vintage paperbacks published in the US between 1948 and 1968 by New American Library (Signet and Mentor imprints). Over time I'll write about Bantam, Harlequin, Fawcett, Ace, and Ballantine who all offered paperback reprints of best selling authors in this mass market format and remain collectible today. The marketing of these paperbacks is a fabulous example of the four P's of marketing, product, price, place (distribution) and promotion. Of the four P's, today's collector is probably most impacted by product, reprints of best selling, now collectible, authors and promotion, the wild and often scandalous, cover designs! 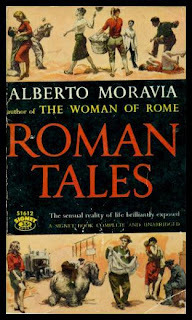 Promotion, via suggestive cover illustrations, even came to the attention of the US Congress and in 1952 the House held hearings into the mass market paperback because, "....pocket-size book which originally started out as cheap reprints of standard works, have largely degenerated into media for the dissemination of artful appeals to sensuality, immorality, filth, perversion, and degeneracy." What motivates my interest in collecting vintage paperbacks is the cover treatment in vintage paperback reprints of my favorite authors. 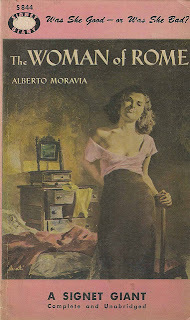 I collect Alberto Moravia (1907-1990), an Italian novelist who wrote a number of wonderful novels exploring what it is that makes us human during times of great challenge. His writing remains a powerful example of the power of the novel to force us to think about who we are and how we act within the context of ever changing economic, political and cultural reality. The Woman of Rome, by Albert Moravia, translated into English by Lydia Holland, Farrar, Straus and Company, New York, 1949 was a best seller in America when first released. 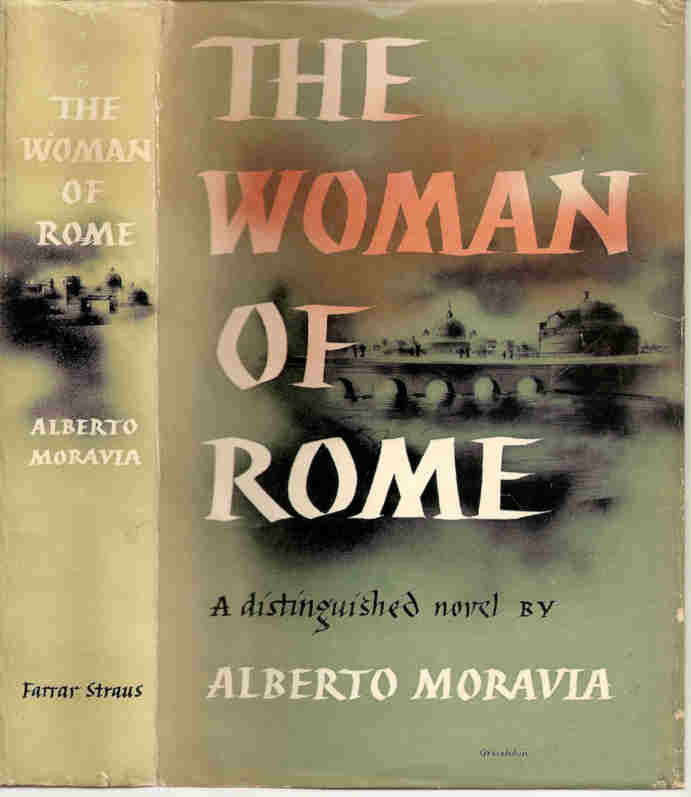 The Woman Of Rome tells the tragic and powerful story of the beautiful Adriana, born in the slums of Rome, who dreams of a better life and ends up a "....prostitute who pursues her trade casually even happily" (cover copy). While I own a very fine copy of the first edition, first printing, I would like the Signet, New American Library edition, as well. 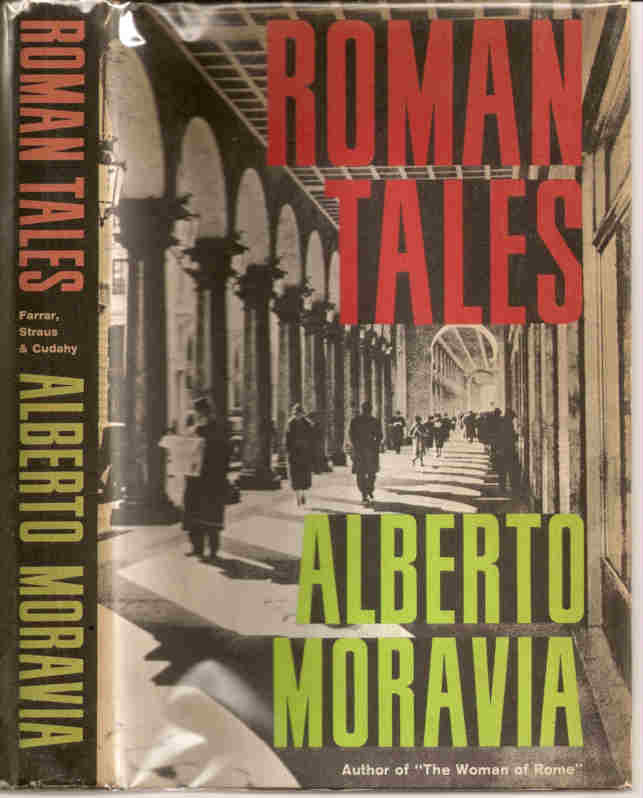 Over the years, especially when wandering book fairs, I have acquired a few New American Library editions of Moravia and always keep my eyes open for additional Moravia in vintage paperback to add to my collection. National American Library was founded in 1948 and included the imprints, Signet fiction, Mentor non-fiction, Signet science, Signet Classics, Signet Key(for young readers ages 10 to 14), Mentor-Omega (featuring Catholic philosophers) and Mentor Executive Library (for businesspeople). My collecting interested revolve mainly around the Signet fiction imprint. Notable authors reprinted in the Signet fiction line included, James Joyce, William Faulkner, Mickey Spillane, Arthur Koestler, Jim Thompson, Erskine Caldwell, Flannery O'Connor and Henry Miller. If you collect any of these authors acquiring the Signet first edition, first printing paperback release will add some depth and most likely, spice, to your collection. 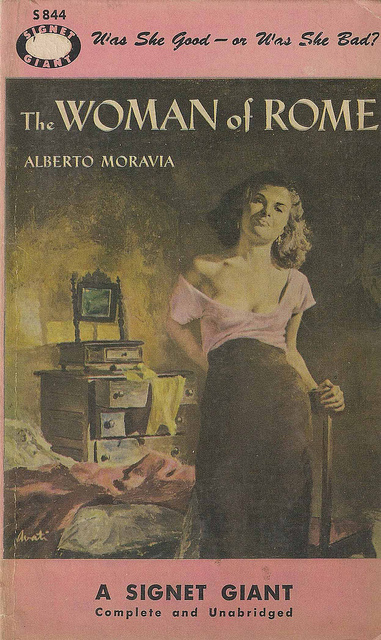 Signet published 15 paperback editions of Alberto Moravia between 1948 and 1968. I own both the hardcover first edition, first printing and the Signet first edition, first printing of four of those titles and always keep my eyes open to add to my Signet collection. 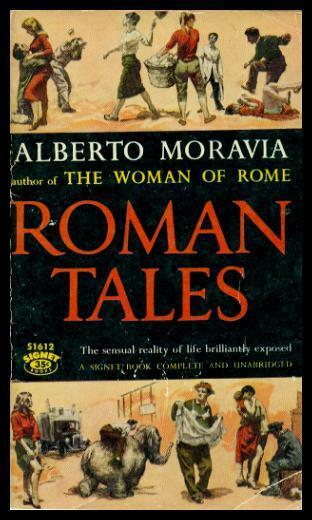 My priorities include, Roman Tales, More Roman Tales, The Empty Canvas and Two Woman. 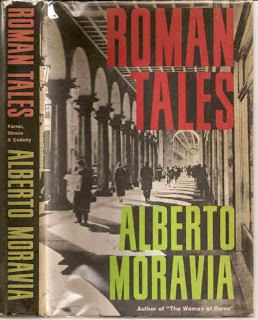 Over time I expect to have a complete Signet subset of my Moravia collection and I know that I'll enjoy exhibiting the different cover designs and always be able to tell the story of the National American Library.